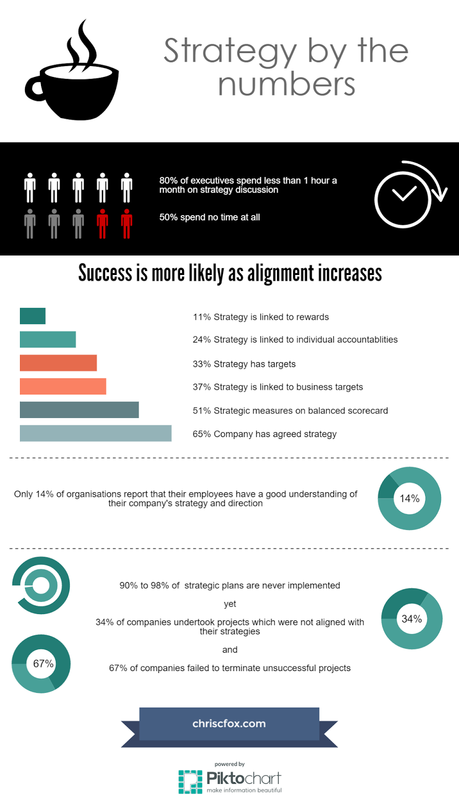 The numbers suggest that organisations are just not that good at strategy. This is my first attempt at putting something up on Slideshare. Please let me know what you think. And, of course, if you need some help avoiding these pitfalls, feel free to drop me a line. Strategy by the numbers is now also available as an infographic. Another disturbing yet interesting number is 67%, companies that failed to terminate unsuccessful projects. Thanks Balajhi. Yes, the 14% figure is very disappointing. I wonder how much of it is because people still believe that they must keep their strategies secret in order to protect their businesses from competitors. There is an interesting aside at the end of the video at the bottom of http://strategiccoffee.chriscfox.com/2010/04/porters-5-forces-analysis.html in which no less than Michael Porter himself debunks that notion. I was hoping to include some more positive figures on how firms that do get strategy right are able to outperform, but have not been able to lay my hands on those statistics yet. that's a good slideshow - a proper wake up call for all. Had no idea that the numbers are THAT bad! I've got to push harder on long-term goals myself. Have you thought about making an infographics with that data? Thanks for the feedback Chris. I had not thought about doing it as an infographic, but it is a good idea. I wonder if my technical graphics skills are up to the challenge :-) ?